Step 1: chop eggplant, fry in olive oil. Good olive oil here helps the overall flavor considerably. I prefer to slice the eggplant into discs, then chop into fourths. Step 2: add fried eggplant to blender along with some tomato puree. Step 3: blend to a puree. Step 4: add garlic to sautee pan, sautee in olive oil until fragrant (do not brown), add eggplant-tomato puree, tomatoes (canned best), rosemary, red chili pepper. Sautee 15-20 minutes. Step 5: in another sautee pan, fry some more chopped eggplant. 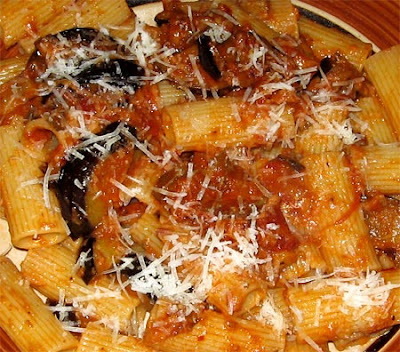 Step 6: combine the sauce and the eggplant, grate some pecorino cheese over the top (I used pecorino sardo here). Step 7: add to your favorite pasta, it went well with rigatoni.